Baum-Kuchen: Baum-kuchen will be at Remodelista Holiday Market! Baum-kuchen will be at Remodelista Holiday Market! 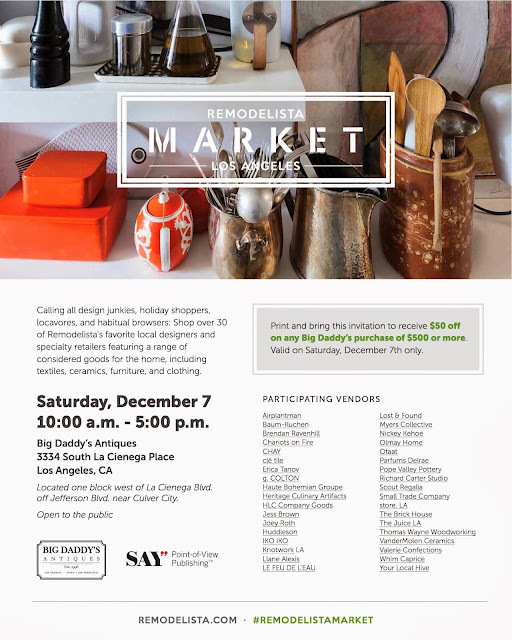 This year Baum-kuchen will be participating TWO Remodelista Holiday Market! One in Los Angeles... and a week later in San Francisco. Talk about expanding the comfort zone! I know it will be a lot of work for us to prepare for the event but I am excited to be able to share our Baum-kuchen goodies with audience who are searching for something meaningful for holiday seasons. I just got some of the details from Remodelista team today... including other participating designers/shop/artisans from Los Angeles. If you are in the west side of Los Angeles, this will be a perfect place to look for inspiration! The venue, Big Daddy's Antiques is also worth checking it out. It's an amazing warehouse style shop full of vintage! Saturday, December 7 10:00 a.m. - 5:00 p.m.